Red lighting can be used overnight for night time viewing. 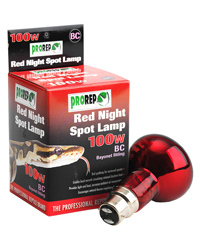 100W Red R80 format clear reflector spot bulb. This is a brand that we have previously bought elsewhere online, typically from eBay sellers, but now that we have found Blue Lizard we shall be sticking with them because their prices are keener, their delivery charges are fair & reasonable, and their turnaround is very quick. NONE of which I am aware!!! Sorry haven't needed to use yet -- were bought as run out of bulbs!!! They do the job -- sadly don't last very long -- that's why needed to buy back ups!! !